"laughing about the Hercules synchronicity. You just can't make this stuff up as I keep saying!" Hmm the label on the photo above is "compass-rose-coruna-galicia-spain-representing-different-celtic-peoples-located-near-tower-hercules-37377858"
There is an actual Tower of Hercules, an old lighthouse or Pharos, in another image that the rose points to. This is a closer examination of the image I did last night. What is labelled as Brittany above, is in fact Tarsis, which is probably Tartessos in Spain rather than Tarsus in Turkey, as one online "Celt" seems to think. Man, it took me about two hours to get the above post through. Incidentally, there have been two sightings I know of of small bright lights travelling on a north/south axis toward the west here, both of which were late afternoon and vanished into clouds under a relatively clear sky. Blue.. I do think there's something to all this and any input you have is much appreciated. As is that of anyone else-this is pretty complex and I'm guaranteed to be making mistakes here and there, even if the basic theory is correct. Of interest this evening, just before sun set, the Air Force Hercules was back doing what looked like a grid search basically north south, south north in the general area just west of my place, tending to head out further west with each pass. Noticed it going on until it was dark and then could still make out navigation lights running the same grid pattern, this was slow and not a commercial aircraft of which we have plenty of also, so I get good at telling one from the other. Need I say the area I live in boarders the Manukau Harbour, this was according to Bruce Cathie’s grid alinement a ‘hot spot’. And it was here that he saw his first UFO. Of course the fact that I now live in this area once again (it was not that far from here that I grew up) is just a coincidence! I was just doing a little research on the area and came up this this sad statistic. Remember how 9’s always seem to appear in my life path well the numbers in the fact below can’t be denied. Because of the large harbour area and narrow mouth between the Manukau Heads, tidal flow is rapid and a bar at the mouth makes navigating in or out of the harbour dangerous. New Zealand's most tragic shipwreck occurred on the bar in 1863 when HMS Orpheus ran aground in clear weather with a loss of 189 lives. I'm having a huge amount of trouble with computers lately-either freezing or crashing but more later today I hope. 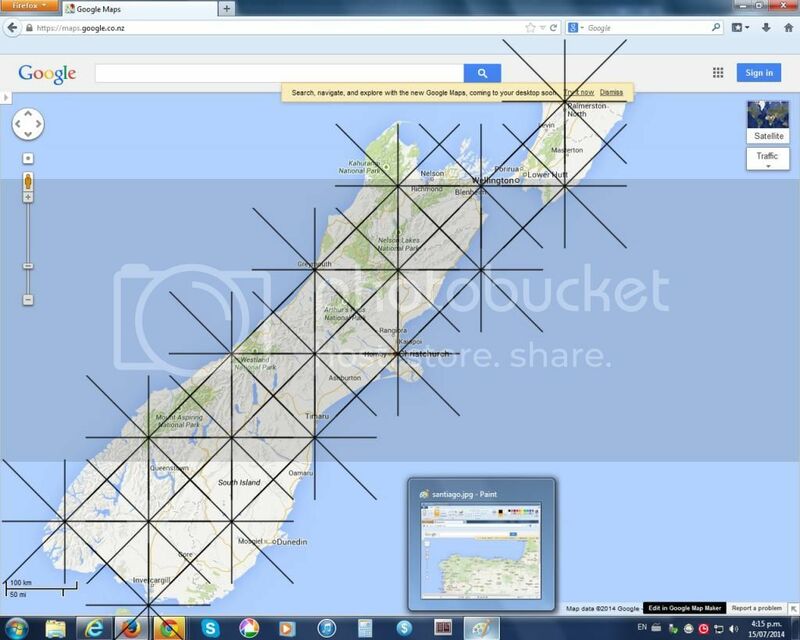 I think this is an artificial grid, overlaid on the natural one(s) using a core 8 Spoke design so may not correspond to a Cathie Grid.It does look as though it's oriented to local Maori tapu points. Here's an image I made after remembering the octagon in Dunedin. I wouldn't know the rationale behind the NW line, but it does indicate a common pattern being used. Great thread, keep it up! You are really onto something here kmria! Best of luck to you in your adventures! Starchild has some interesting information and I look forward to more! 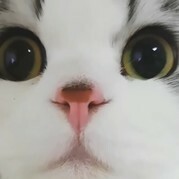 I can feel the different energies coming in, also my animals have been acting strange for the last few days. Back on track I think. That line at 20 degrees in New Zealand if taken north goes through.. the Alaska Triangle. I'm pretty sure about that and will make a detailed image later just to be sure. c) was near a rivermouth in the immediate area of La Coruna. I haven't yet found it but had in mind a similar place near the mouth of the Danube,as it disgorges into the Black Sea, named Sulina. I'm sorting this out as I go along, and a lot of it's speculative, until I get meaningful results so pardon any chopping and changing in course everyone. Okay, the Starseed said recently "this is not the base chakra it is the crown" in relation to the area. A few weeks ago an English immigrant, whose father was into leylines in Britain, gave me a piece of paper which depicted Aorangi/Mt Cook as the Crown chakra so I'm following this up. Especially the remark about "the two eyes" locally, which I didn't quite get. North by Northwest, huh? Ya don't say! North by Northwest is a tale of mistaken identity, with an innocent man pursued across the United States by agents of a mysterious organization who want to stop his interference in their plans to smuggle out microfilm containing government secrets. just out of interest KMRIA does Machu Picchu line up with anything of interest on the other side of the globe? OK had a look for myself it's right on the Cambodian boarder with Vietnam, kinda makes you wonder about all those secret missions in that area during the Vietnam war. Might have been more than dope they were smuggling out of there! There's some lines which come out of the sundial analysis which touch on that part of the world-the Golden Triangle eh? I read a novel in Oz when working at the library about a Oz soldier who escaped from a prison camp in Vietnam and eventually found his way with great hardship back to base. On the way he saw a UFO crashed in some bushes, had a look at it, then carried on. No explanation given in that very dry Oz way. I've yet to collate that with other lines, as I'm a little distracted by the local Grid business. But soon I'm going to sit down and attempt to put it all together. Does anyone know of a good globe mapping program, opensource, as Guggle Earth keeps crashing on me at the library (I wonder why?). And Blue... I'm having a look at Golden Gates/Silver Gates in regard to locations and astrological signs/times which I'm very new to-do you have any info on that? E.g is the Auckland Harbour Bridge a "golden gate."? Hey K, have you tried Marble ? thanks jfuture! I'll download it tomorrow... time's up for the day here. We had a look at the area around the new cardboard cathedral here yesterday, at the location shown in post#28 on this thread. There is a new installation on the grass immediately in front of the cathedral. The Starseed said this is (bad) ET technology. There are several murals nearby, and I decided to have a closer look at them. 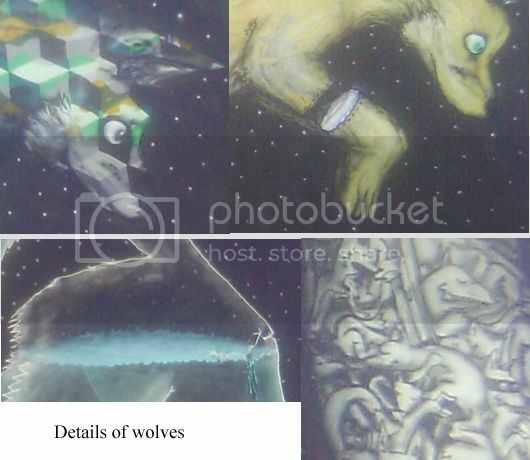 The wolf mural (in the car park of the Christian church mentioned below. Tentatively I can see a North -> South progession: Cube ->possible reference to landscape (the damage caused by the EQs? )->a body of water (Lake Ellesmere? )-> "ghosts". I found the image sinister and disturbing. (The Starseed comment is that the Artifact opposite the Triangle Cathedral is part of controlling the Sky Grid, and the Diamond at its centre had been damaged recently and they were trying to repair it but couldn't. By one of those bizarre Coincidences I'd been talking to someone the previous night, and they'd said they been out driving when they'd seen a grid in the sky over Christchurch but didn't have time to take a photo. More than surreal, KMIRA. It would be interesting to hear any comments of the public. Are they taking any notice? Well I'm going to be down there in a couple of weeks KMIRA as you know, I'll sure make the time to have a look around and see what bites me as I do so. Amazingly enough, the answer is generally No. 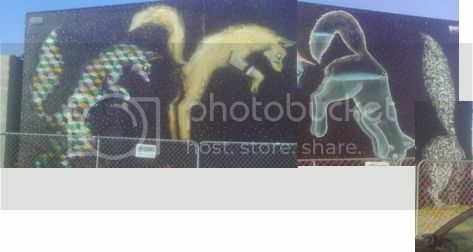 However while we were looking across at the ET mural we saw a woman taking photos and the Staressed said "She's a super healer" his word for the others arriving in the near future to clean up the mess .. after the HAARP grid is taken down. The mural is on the wall of a Christian church ( Baptist I think) catering to Maori and Pacific Islanders. 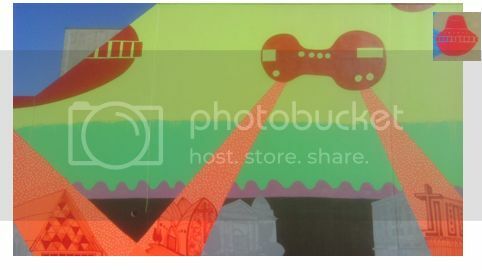 The mural below is in two parts, one on the southern wall depicting red UFOS which connects to one on the western wall. 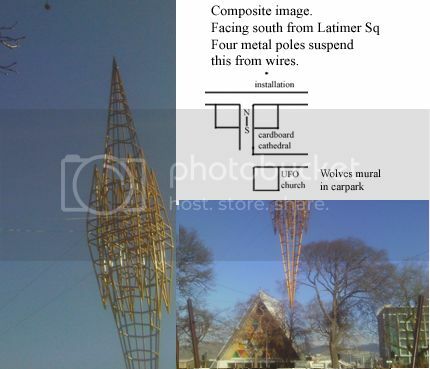 The first image shows a UFO beaming light at three churches which intersect with three other churches. 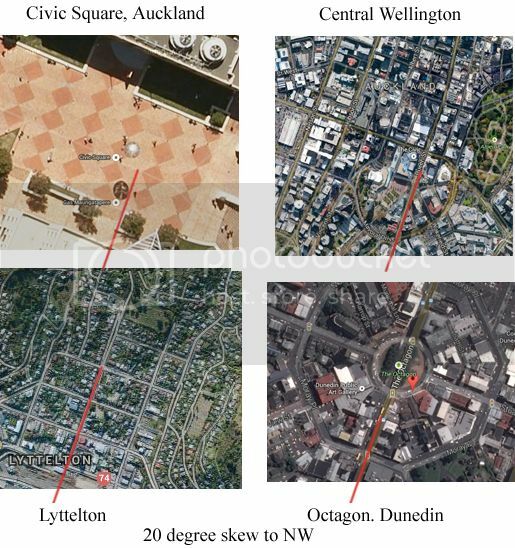 I've lived and travelled all over Christchurch and don't recognise any of the churches offhand. The Starseed's commentary is that the church on the left represents the church on top of the Fairy Mountain (Te Ahi Patiki) which "can't be seen"). The one in the middle is in London where the Royals communicate with the ETs. The one of the right is where (bad) ETs live... and he pointed out the building. This part is "where the Bad ETS live.There are a couple of humanoid figures in it:one has what looks like claws for hand, and the other a three fingered hand. I've also included a detail of the South wall mural above, showing a Waning crescent moon. The significance of the colour blue of the West wall is that blue frequency light is also used apparently used to control minds via the Grid. No one notices this when they're popping into to get brainwashed?! If it's a full moon Blue I'd advise stocking up on silverware before you go out at night. I was digging into Dante Santori's whole bunch of visual analysis on the movie "The Mothman Prophecy", which he recently uploaded. I realised how easy for us to get tamed with similar "messages", as we are so swamped by so many visual and other form of messages surrounding us; we become almost numb to pick up the stuff like KMIRA has been picking up. But more interesting, once that side of antenna of us resume working better, then synchronicity starts to flow. It seems to become more easy to notice those "intended hidden messages"...or perhaps we can bring in more synchronicity by being attuned better, maybe?? Anyway, the flow of synchs happened to me one after another when I started to really watch Dante's Mothman stuff, it got really REALLY freaky. But synch after synch occuring, I can only say why it wasn't like this! So I guess most of the public don't look at things with intention. I also suspect that there may be some CUES that will "ring" at some point, embedded within us. Like MK-Ultra, may be a cue is given to us in some form. We are trained not to act upon it till we get that cue. Some may be embedded for our protection laid by....someone, and some may be embedded to wreck us on cue. Finding hidden messages can be a tough call for some who choose to sleep through and only the awaken ones can notice the tactics and messages BEFORE the cue happens to everyone. In this case, this is a positively intended interference made to us by someone. But there could be some negatively intended interference made to us by someone else, too. But I feel that's lurking in our DNA somewhere. unity have you seen the directors cut of the movie Mothman Prophecies, with the DVD comes another disc where the director discusses the scenes he wanted to include but financial backers wanted them cut out. It includes the whole town seeing UFO's over several nights etc etc. All cut from the final movie to detach it from the reality that occurred. Oh Wow, I didn't know that, Blue!! Thank you for letting me know...! I have to go and seek out the director's cut somewhere and watch it! That movie has so much of "hidden messages" packed in the scenes, it's not funny. It only means to me that the movie was made by the one who planned 911 (and other disasters) and showing off their power and sharing entertainment the way they can dig into deep. ....Just like rich people having private party. Yes and not only does the director have a rave on the special second disc in the set, it also includes a doco on the investigation of the real mothman series of events.